A festive tribute to America's beloved artist, this Norman Rockwell Christmas train set displays four classic Rockwell holiday illustrations. From Santa fulfilling a child's wish to a father and son bringing home the tree, each heart-warming scene is charmingly detailed. 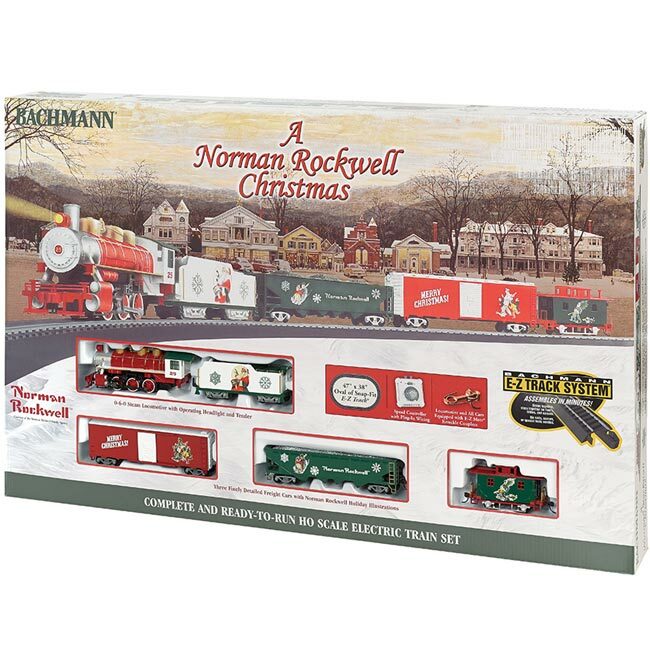 An instant classic for around the tree, the ready-to-run Norman Rockwell Christmas train set is sure to delight the whole family this Christmas, and for many holidays to come! HO scale 0-6-0 steam locomotive with operating headlight & tender, quad hopper, box car, and bobber caboose. 47" x 38" oval of snap-fit E-Z Track including 12 pieces of curved track, 1 piece of straight track and 1 plug-in terminal rerailer. Power pack and speed controller. Illustrated instruction manual.